As some of you may have realized by now, I am a bit of a hobby butterfly. Despite my commitment to building and painting Tyranids for 8th edition I have gone somewhat off piste and started fiddling with my Night Lords again. What can I say? Sometimes a project just calls to you and I am always too weak to resist. Ahriman?? Never heard of her! I've had the Ahriman miniature from Burning of Prospero hanging around for a long time (since the release day in fact!). I had a few ideas of what to do with him but nothing that ever materialized into a plan. However, on a whim, I started cutting the parts off the sprue and before you know it, the terrifying vision above was born! The tricky part is that, unlike the other miniatures from the Burning of Prospero, this guy screams 'Thousand Sons'. The miniature is absolutely covered with scarabs, runes, scrolls and other sorcerous paraphernalia. Perfect for the planet of the Sorcerers, but not very fitting for a son of the Eighth Legion! This led to a great deal of cutting and scraping with the hobby knife to remove the symbols from his shoulder guards and chest. 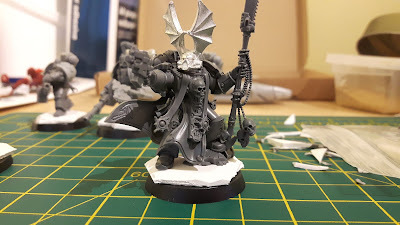 I also removed the scarabs from his staff and replaced them with a couple of skulls. Thank you polystyrene cement!! The larger bits of conversion are more obvious. I cut away the kopesh blade from the top of the staff and replaced it with a thunder edge pattern chainsword to make a massive Nostraman Chainglaive. The reaching hand was replaced with a bolt pistol and the head was replaced with one from the ancient GW Night Lords conversion kit. I'm not quite finished with the build just yet. A few areas need a bit of green stuff and I want to add a few more grisly trophies. However, I am looking forward to getting some paint on him to really bring the model to life. Stay tuned for the next installment where I will undoubtedly have gone off on another tangent and be kitbashing some other random miniature. Now he just needs a name. Something overblown like "Kleptobazmus the Duke of Death". Or The Duck for short. He is hereby named Kleptoblazmus in honour of the mighty Blazmo. May his hit rolls always be ones! Only if you spend ages painting him. You know the rule - the nicer the model, the worse they perform! I will dedicate hours to slavishly painting this model. He will be the only character ever to die from an overheating bolt pistol. His armour rolls will always be "1". Any impact on those oversized bat-wings could snap his neck like a twig!